After months of disturbing behavior, Gardner Quinn has vanished. Her older sister Fredericka is desperate to find her, but Fred is also pregnant -- miraculously so, in a near-future America struggling with infertility. So she entrusts the job to their brother, Carter. Carter, young but jaded, is in need of an assignment. Just home from war, his search for his sister is a welcome distraction from mysterious physical symptoms he can't ignore...and his slightly-more-than recreational drinking. Carter's efforts to find Gardner lead him into a dangerous underground, where he begins to grasp the risks she took on as a Nurse Completionist. But his investigation also leads back to their father, a veteran of a decades-long war just like Carter himself, who may be concealing a painful truth, one that neither Carter nor Fredericka is ready to face. 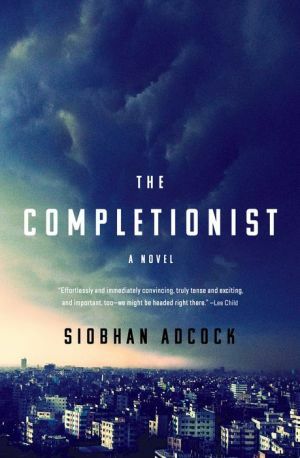 In the tradition of THE HANDMAID'S TALE, THE COMPLETIONIST is speculative fiction at its very best: imaginative and propulsive, revealing our own world in bold and unexpected ways.